It was established long ago that my family does not bear the so-called “Luck of the Irish” (possibly because we’re not Irish), but instead we bear the “Luck of the Curriers,” which is the opposite. This means that despite Laura’s wonderful efforts to get us on the fast track to Dublin via Wales, I instead followed our original itinerary to Lancaster (en route to Isle of Man), only to realize three hours later than we travelled 250km in the wrong direction. As I was about to step onto the tracks of an oncoming train, Mark intervened with beer and promises of chocolate*, and I went off to rectify the mistake I’d made. When Laura had done her computer jujitsu to get us to Dublin, she’d given us a schedule with a three-hour layover, bringing us to Wales at 2:00pm so we could find the mysterious “hut circles” [part of the scavenge, to get points for going to Wales] before boarding the 5:15pm ferry to Dublin. The problem was that our detour cost us the layover, and the next ferry to Dublin didn’t leave until 2:40 a.m. the next morning. We decided to scavenge, spend the night (3 hours = “night”) in Wales, and leave to Dublin the next day. Our justification was that it was no different than leaving our hotel in Sri Lanka at 1:30a.m., or waking up to hike Adam’s Peak at 2:30a.m. Once we’d accepted it, it was time to drink. One of our challenges was to purchase three English beers and do a taste test, and we needed to get it done before we got to Wales, so we bought three cans of local brands and looked for a table on the train to film our video. The only table we found was already occupied by a couple, so we asked if we could squeeze in next to them. They quickly moved their things aside and asked us to sit. Then we pulled out all of our alcohol and asked them if they minded if we drank. “We’ve had one of those days,” I explained. They eyed our inventory. “Only three cans? You should have gone for four,” they said, and immediately I knew we would be best friends. This couple turned out to be Jill and Ian, residents of Wales who were returning from a visit to their son–a flame thrower–in Germany. Intrigued as to why we’re filming ourselves drinking beer (and one cider), we explained our situation: we’re on a Global Scavenger Hunt, we have this list of scavenges, we’ve been to seven countries with three more to go, I lost my phone and got us on the wrong train, we’ve been forced into alcoholism, etc. They were completely supportive and curious–asking us questions, wanting us to share our stories, looking up answers to scavenges on their phones when we told them we couldn’t Google anything ourselves–and they even donated money on the spot to our charitable causes as soon as they learned we were raising money. Quite simply: they were two of the most awesome people we met during all of our travels. 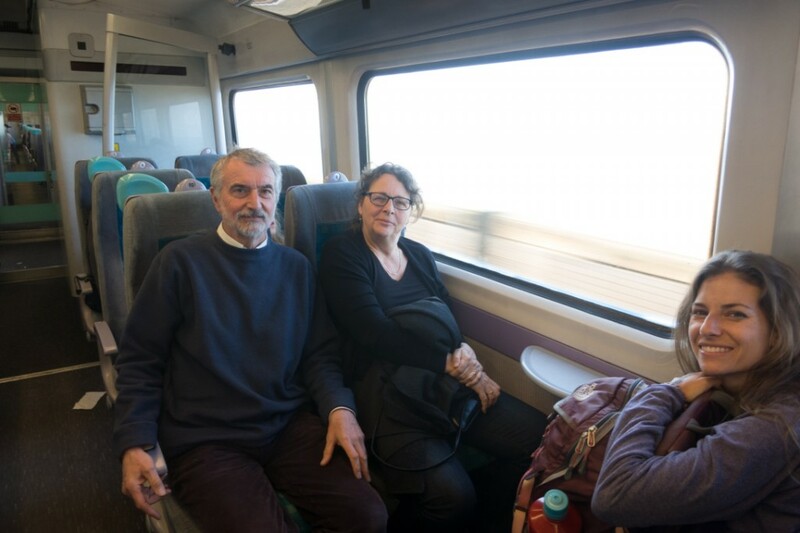 It was such a delight to spend the next two train rides together, and they were a huge help to us! We found the hut circles later that evening (not even the locals knew where they were), and we walked along the sea cliffs just as the sun was setting. Finally, to end the night, Mark followed through with his bonus challenge (mine was street performing): to take a swim in the Irish Sea. I was the one screaming–not him–as he went headlong into freezing water. And we had the best taxi driver! Not only did he take us to the perfect beach spot, but he also agreed to take photos while I filmed. He had a tarp in his trunk that he used to cover the seat afterwards, and so, I guess you could say, we ended the day with a splash.